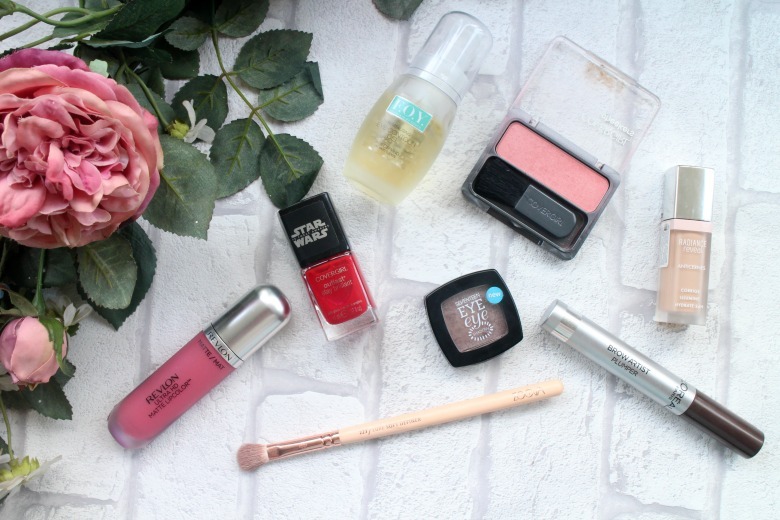 It's a very make up heavy favourites post today as I reverted to something of a lazy make up routine the past month and all these items tick the box for that. First up I'll start with some products you may recognise from my Superdrug Haul. Bourjois Radiance Reveal Concealer is making waves in the beauty community and I jumped straight on that bandwagon and can say that for me the hype is deserved. I've never been one to just conceal and go but on weekends when I'm even less inclined to wear make up but want to make something of an event I've been sweeping this on, adding some Chanel Les Beiges Powder and I'm good to go. It doesn't crease under the eyes, far outweighing others I've tried and lasts all day. Another plus is it looks far more higher end and is less messy than other offerings in my collection. The Revlon Ultra HD Matte Lipstick in Devotion has been a big hit, as has the formula of this product. I did return to Superdrug to look at other shades but none sparked any excitement as Devotion did so I left empty handed and stuck with this favourite. A subtle shade of pink but not too subtle that it looks like I haven't bothered at all it goes with almost every outfit. The slightly chalky feeling texture goes on like silk and dries down without drying lips out so I'm crying for lip balm later. I can reapply throughout the day without fear of cracked lips although this is certainly a longer lasting product compared to others. It's definitely worth checking out if there's a shade that you like. Next is L'Oreal's Brow Artist Plumper which has quickly replaced my former love of the Maybelline BrowDrama. With a much more sensible, smaller brush this is far easier to brush my brows out and fill in any gaps very quickly. It dries quickly and is far hardier against my annoying habit of stroking my eyebrows and definitely requires more effort to displace and ruin my efforts. Carrying on my lazy make up theme I've been reaching for the Seventeen Mono Eyeshadow in Rose Quartz on a daily basis with my Zoeva 227 Definer Brush* for a quick eye make up look. Again I've never been a one lid colour and go kind of girl, even with my simple eye make up routines I'd always add something into the crease, outer corners and some sort of liner, until now. The Zoeva 227 is a worthy contender for Mac's famous 217 of which I have many but it's the 227 I've reached for. Blending out Rose Quartz on my lids and some mascara I'm happy enough with my make up to be seen in the office. The Mono Eyeshadows are compact, pigmented and last a day in the office which often is all I'm looking for. As I continue my make up declutter I've pulled out Covergirl Blush in Pretty Peach that has been sitting in the draw for ages following a US Beauty Haul. Hailed as a dupe for Mac Melba Blush it's become a firm favourite if not for the cheap and unpleasant packaging. I've been reaching for this a lot as the sun shines and it gives a nice soft glow. Painting my nails is a chore I don't enjoy and I'm always torn between painting with normal polish multiple times or wearing gels and having the chore of removing to reapply. First world problems of course but I've settled on painting for nails as it feels like an easier process at times. Another Covergirl product and this is the red polish they brought out in their Star Wars range. It's your standard shade of red but applies nicely, if the brush is a little small for my liking. I get a good few days out of this before any wear starts to show. Finally I'm throwing a skincare item in which has become a big hit as we hit hayfever season. I've recently been testing some products from F.O.Y and the stand out for me at the moment is the Revitalising Eye Gel*. This is very much a gel and I think I need to start keeping in the fridge for some extra cooling properties to soothe my itchy eyes. The packging is rather luxe for an eye cream and whilst it's not the ideal travel companion it's nice sitting atop my dressing table. So cool isn't it! Have a great weekend. It's definitely worth hunting out, I'm really enjoying using it and it's definitely one I'll repurchase.